Who Doesn’t Love A Good Sandwich? A sandwich is the perfect mid day meal. However, a sandwich is good for breakfast or dinner too. More and more people eat breakfast sandwiches on the run, going to work, than ever before. There are discrepancies in the time frame, of when the first sandwich was ever created. The first actual “sandwich” was created in the first century B.C., by a rabbi, Hillel the Elder. He created it by putting between two matzohs, chopped nuts, apples, spices, bitter herbs, and wine. Thus the first sandwich was born, and shared throughout passovers, ever since. The name sandwich was derived, when John Montagu, who was the fourth Earl Of Sandwich, ordered a meal of meat, served between two pieces of bread. It is said he ordered this often, when playing cards, as he did not want to leave the table for dinner. People accustomed his meal to his namesake, and thus the name sandwich was born. The sandwich has changed many appearances since the first one was created. There have also been different names, given to a sandwich, depending on the region it is prepared. Long sandwiches, which are sliced lengthwise, and filled with many substances, are called submarines, subs, hoagies, grinders, Po boys, heros, and Italian sandwiches. There also names given to specific sandwiches, depending on the ingredients or how they are prepared. Som examples, are the B.L.T., Reuben, Club, Dagwood, open-faced, or even the good old PB&J. Along with the types of sandwiches there are, comes the varying breads used. A true Reuben can only be made with Rye. Some people used pumpernickel bread. 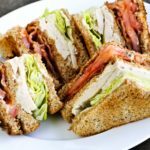 Club sandwiches are typically made with white bread toasted. Cubans, are usually made with cuban bread, similar to the french and italian rolls. Open faced sandwiches can be made on any type bread, and are usually eaten with a knife and fork, as well as hot sandwiches with gravy. A favorite type sandwich which is only found in New Jersey, or with Jersey transplants is made on kaiser rolls. To true New Jerseyans, there is nothing like a Pork Roll, egg, and cheese on a kaiser roll, with ketchup to get your day going. Another favorite is having a buttered kaiser roll with coffee. What about the “grilled cheese”? This a favorite that is often paired with a good cup of Tomato soup, for dipping purposes. No matter what your favorite sandwich is, it is an ever changing meal between breads. It is also an easy market to get into, with hardly any waste, such as in regular restaurant foods. AS a matter of fact, the market for sandwiches is staggering. About 50% of Americans eats a sandwich everyday, sometimes two, A breakfast sandwich, then a sub, or burger for lunch. This only the count for those over 20 years of age. It does not take into account children in school, or preschools as well. All this writing about sandwiches, has made me hungry. I think I will go get one now!